"A Funny Thing Happened on the Way to Heaven, Volume 6"
This book is dedicated to my best friend, Jesus. If you were to ask me to sum up the twenty-one years, that my family has been in the ministry, I would have to say, "This one thing I surely know, God takes care of His own." During the first years of our ministry, Bunny, my husband, our son Orville, Jr., and myself made our home in Hampton, Va., where we pastored a local church. We also ministered in the jails, and in the nursing homes. Later, we had a radio broadcast, and a gospel tent for revival meetings. While doing all of this, Bunny worked in the Newport, News Shipyard. But preaching the gospel was the center of his life, not the shipyard. Our family was always together. Wherever Bunny preached, Orville and I went with him. Together we shared, together we learned, and together we could say, "God takes care of His own." We had become accustomed, and very contented with our life-style and calling. But God, anytime you see, "but God," look out, change is coming. Oh, what a change it would be! The change came in 1975, when God called us to a work, and church of a different sort. Our new church would be a "Mobile Chapel," our congregation, truck drivers, and truckstops our new home. 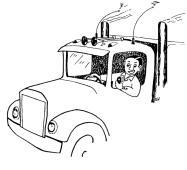 God had called us to carry the gospel to truck drivers. Together we became a "trucking family." We packed up our belongings, sold our home, said "good-bye" to the shipyard pay-check, and with our eight year old son, we started our journey of "Trucking for Jesus." Thirteen years have passed since our move [editor's note: this was written in 1988]. A lot has happened over the years. Orville, Jr. grew up in the truckstops, always busy with school work, but never to busy, to help Mom and Dad minister to the truckers. He brightened everyone's life with his music. He would play his guitar, mandoline, dobro, and sometimes Dad's banjo. But when little boys grow up to be men, they leave home and our little boy was no different. Orville is now 22 years old, and has a nice home in Va. We always look forward to spending time with our "No. 1 Partner." Bunny and I are still trucking with our 18-Wheeler Chapel, (part-chapel, part-living quarters) pulled by a 1962 yellow Kenworth, named "Sheneeda." 'Cause "she need a" lot of love, and "she need a" lot of attention. We thank God for this special ministry filled with precious memories, and miracles of God taking care of His own. Miracles like the time Bunny needed a new pair of pants. We didn't have extra money for clothes, but we believed God would provide. The next morning when Bunny started to the truckstop to shower, he saw something laying on the ground beside the chapel. He walked over, and there lay, just his size, a brand new pair of blue-jeans. Another time, Bunny wanted to call his Mom on Mother's Day, but he didn't have the money for the call. God spoke to his heart, and told him to go look in the phone booth. Bunny stepped into the phone booth, and there on the tray under the phone, lay the exact change for the Mother's Day call. One morning a farmer found, in the middle of his wheat field, a tractor trailer tire. Puzzled at how it got there, but having no use for it, asked if we needed the tire. The wheat farmer did not know of the prayer the night before, asking God, to send us a tire for the Chapel. It was on a Monday morning, and we were scheduled to move the Chapel to another truckstop. Bunny and I felt led to postpone our trip. We stayed where we were. That same Monday evening two tornados hit the area where we were scheduled to go. God kept us from the storms ahead! One summer I needed some clothes for our revivals. I asked Bunny to pray with me about my need. That week a friend asked me, if she could give me some clothes. She gave me a new wardrobe! Every outfit was so pretty. I could have never afforded such nice things. One of the outfits she gave me was a red suit. I hadn't told anyone, not even Bunny, but I had desired to have a red suit. God knew my needs, and God knew my desires. In the thirteen years we have operated the Chapel, we haven't passed an offering plate, sold anything, or begged the churches for support. All donations we have received have been free-will offerings. Bunny and I have always depended on God, to lay it on the hearts of the people to give. Yes, always, God has supplied, and met every need. In all the years, the ministry has never been in debt one time! God hasn't only met our needs, but He has healed our bodies. Once I was so ill, I could hardly move. I asked Bunny to pray for me, as he was praying I fell asleep. Two hours later I woke up, healed from the top of my head, to the soles of my feet. The greatest of all miracles we have witnessed, has been the men and women (over 1,600) that have received Jesus as their Saviour. Bunny and I have seen them come with different needs, and in different situations, but God dealt with each heart to come to repentance, by His Holy Spirit. I can't leave out how God has fed us. Many times He has sent the truckers to fill our cupboards. Phil and Diana, a husband and wife team, gave us a case of Spam at a needed time. There's not hardly a way I haven't fixed Spam. I've baked it, fried it, barbecued it, diced it and sliced it. Thank God for Spam! Glen, a trucker from Oklahoma, used to haul chickens. We were always blessed with a chicken dinner, when Glen came by. God sends in our needs, but He also makes a way for us to share with others. Like the time a trucker gave us a case of chicken-pot-pies. Later, another driver gave us a 40 pound box of green bananas. There was a hold back to that gift. They all ripened at the same time. 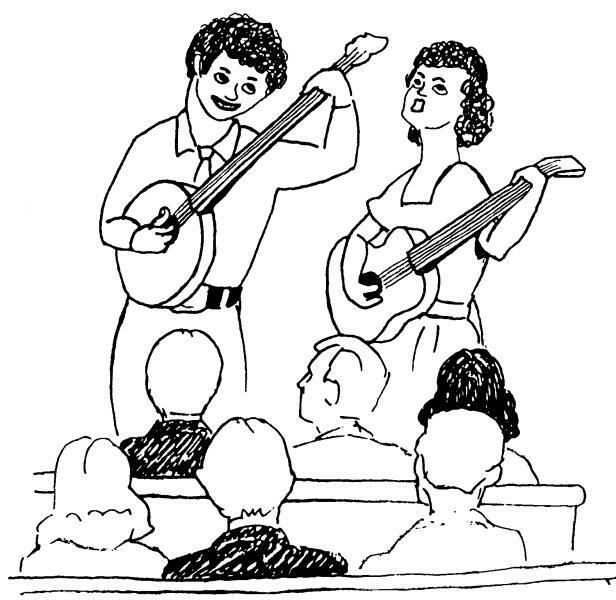 One week when folks came to the Chapel, we offered them a cup of coffee and a chicken-pot-pie. The next week we offered them a cup of coffee and "insisted" they have a banana. I can't forget O.T., a trucker from Arkansas, who brings us a jar of his wife's home-made pickles. Vince, a trucker from Bakersfield, California, that always gives us a box of potatoes at Christmas time. Oh, what glorious times we have had! We have been most-privileged to be among the greatest folks we have ever met, the truckers. We have also been blessed to learn first-hand that God takes care of His own. Bunny and I have two dear friends that pastor a church in Tennessee, the Powells. They have been a great encouragement to us, because they have been faithful in the "good times" and faithful in the "hard times." They have held on, and kept the faith. Sister Powell told me about one of their "hard times." The hard time they had was over a leaky roof on the church, and their apartment. They lived in an apartment built on to the church. So when it rained, not only did the church leak, but their apartment as well. When I say the roof leaked, I mean the ROOF LEAKED all over! All over the Sunday School rooms, the pews, the piano, the hallway, the rest rooms, and at times, Brother Powell was tempted to preach in a rain suit. The leak over the rostrum was the worst. Their apartment was on the "disaster" list too. There was not any money for a new roof, so until a miracle took place the Powells bought two good mops. When the rains came, the pastor and his wife would get out the pots, the pans, the buckets, and their mops. There were times it seemed like they were fighting a losing battle. Sister Powell said she covered as much as she could with plastic, but rain water still ruined many of their things. They couldn't even sleep in their own bed during a heavy rain. The leak over their bed could have been described as a "baby Niagra Falls." The Powells just covered their bed with plastic, and slept on a cot in another room. One night during a Tennessee cloud burst, our friends came to a turning point, in their battle of the leaky roof. They had mopped water all night, and were exhausted. Finally, they decided to get some sleep. Sister Powell went to lie down on the cot, but Brother Powell never came to bed. She got up to look for her husband, but couldn't find him. She looked everywhere, but Brother Powell was gone! Once again she searched for her husband, at last she found him. He was in their bed, not the cot, wrapped up in plastic, as the roof leaked overhead. Seeing this sight, Sister Powell spoke great words of faith, as we preacher's wives do at times. She said, "Now, I know, you have lost your mind." Tired, but unmovable, the pastor stuck his head from under the plastic and said, "I'm not sleeping on that cot anymore. I'm sleeping in my own bed. If I drown, I'll go to heaven, but I'll drown in faith, believing God to fix this roof." With that reply, Sister Powell got into bed with her husband. Now, our friends made it through the night. They were a little damp, but they made it. They weathered the storms, and the leaky roof. Yes, their miracle came, a new roof! When times get hard, and it seems like the roof will always leak, don't give up. Just get out your pots, your pans, your buckets, and get yourself a good mop. Then stand your ground. Don't let the old devil cause you to give up, and throw your mop. Be like our friends, stand your ground. 'Cause your miracle is on the way! Have you ever had a day when nothing seemed to go right? A day when your chalk wouldn't write, and your marbles would't roll. I recently talked with a trucker who had one of those days. The trucker said his day started when he was rerouted, because of a snow storm. But, the alternate route led him into a severe wind storm, which blew his tractor-trailer over into a ditch. The only way he could get out of the ditch was to call a wrecker. As the wrecker was pulling him out, (at a cost of $300.00) a spring broke on his trailer. The trucker, after paying the wrecker bill, had to find a repair shop to replace the broken spring. The repair shop "glady" replaced the spring, at a price of $500.00. 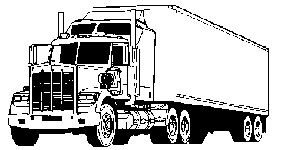 Needing a cup of coffee and a hamburger, (a meal was dfinitely out, after the wrecker and repair bill) the trucker walked into a truck stop. When he walked in everyone ran out. The truck stop was on fire! The trucker looked at me and said, "That's trucking." He wasn't upset, just grateful to get through the day alive. Trucker, when you have one of "those" days: the days when the waitress brings you scrambled eggs and you ordered fried. The days when the dispatcher can't give you a load, but instead gives you the number of "Dial a Prayer." The days when you get the "red light" at the scale house. The days when an Alabama State Trooper looks at you and says, "Go ahead and make my day." Just remember, that's a good time to have a prayer meeting. Prayer can change that day, and prayer can keep you in the right attitude during that day. Now, that's trucking! There are churches built with brick, wood, stone, and some a mixture of all. But our church is a mixture of a different sort. Our church has 18 wheels, a Cummings engine, fuel tanks, a belly mount reefer unit, and a 5 and 3 transmission. When we pray for our 1962 Kenworth tractor, and 1966 Trailmobile trailer church, all the above is included in our prayer list. God has to fuel the tanks, keep the engines running, the transmissions humming, and all 18 wheels rolling. One morning at Raphine, VA., Bunny came in the chapel and asked for the super glue. Now when Bunny comes for the super glue, I get concerned, especially when he heads for the truck. I followed him out to see what the trouble was, when I saw Bunny kneeling by the driver tires on the truck. One of the recaps had come loose, and Bunny was going to super glue it back on. Bunny applied the glue then said, "Get down her Blonnie, let's pray over this tire that God will hold it together, until a better one is supplied." I did "some" praying by that tire! But, praise God, prayer and super glue worked. God held the recap together. We came from VA., making our stops all the way across I-40, to Oklahmoa City, OK. When we got to Oklahoma City, God provided not one, but two new tires! A trucker came to us, and said that God had spoke to his heart to give us two new tires. Bunny and I were moving that day, and didn't take the time to mount the tires. We just put them in the trailer, and headed for our next stop. We hadn't gone 50 miles, when the super glue and recap let go. We didn't get upset, we just praised the Lord. Because one hour before, God in HIS perfect timing, had sent a replacement for the super glued recap. A few years later God had to do some more "holding together." Not with a tire, but with our Cummings engine. The block started cracking, (we couldn't understand why, it only had 2 million miles on it) and when I say cracking, I mean water pouring every where. One 650 mile trip we made, the engine used 43 gallons of water. A new block would cost from 3 to 4 thousand dollars, so a new block was out. Again, we patched, we used J.B. Weld, electric weld, K and W Block Seal, water glass, and anything else we thought would stop leaks. In one year's time, we pulled the engine down 6 times, patching the cracks. We would get one crack patched, then the block would crack in another place. That year Bunny spent more time inside the engine, than inside the Chapel. When truckers came looking for the Chaplain, I just pointed them to the greasy little fellow working on the engine. God blessed in spite of the grease. 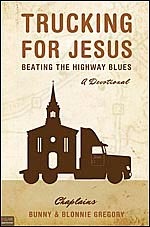 One week beside the Cummings engine, Bunny led five truckers to Jesus. We needed a miracle! Everytime the water would get into the oil, that meant an oil change and new filters. After 186 gallons of oil, many filters and 6 times down -- we needed a miracle! We looked everywhere for a block, but found nothing we could afford. The more we looked, the worse things looked. But God had "victory" for us at Greenville, South Carolina. A Church named "Victory" Assembly, asked us to preach one Sunday night for them. After the service, the pastor felt led to take up an offering for us. The offering came to $300.00. The very next morning, we received an answer about our needed block. That morning we were told about a block for sale at a machine shop. Bunny called the shop, and asked the man that answered, if he had a block for sale. The reply was, "Yes, I do." The man told Bunny that several years ago, a trucker put a new block in his shop for testing and cam-bearings. But the trucker left no name, address, or phone number. He never came back for the block. The man at the shop, said he had done $360.00 worth of work on the block. But, if Bunny would come that morning, and get it out of his way, he would let Bunny have the block for $300.00. The seventh time we pulled the engine, wasn't to put in another patch, but to put in a new block. The transfer of blocks, parts, and wrecker service cost $1,000.00. The week of the transfer, we received mail from a man we hadn't seen in many years. Inside the envelope wasn't a letter, or a note, but a check for $1,000.00! 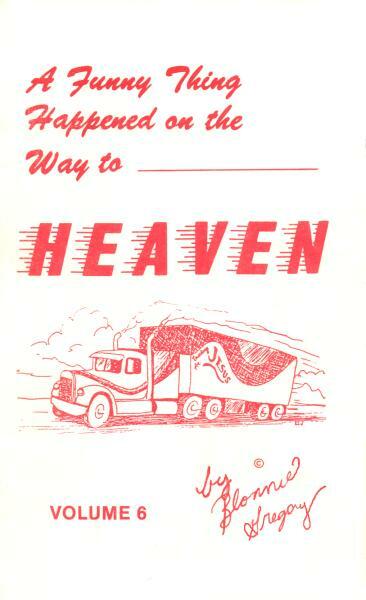 God took a 1962 Kenworth, a tube of super glue, patches, and prayers, and made miracles happen, to send the Gospel to the truck drivers of America. Preachers can get caught in some comical situations. I guess the funniest story I ever heard, happened to a Nazarene preacher I know. The preacher told me of a military funeral he was conducting. He said the family was seated by the grave. The grandmother who was in a wheel chair, sat on the end, holding her five year old grandson on her lap. The Nazarene preacher said he had closed the service, then came the 21-gun salute. When the guns fired, the grandmother was startled; she jumped back in her wheel-chair causing it to overturn. There she was, all sprawled out on the ground, taking her grandson with her. When something like this happens, there is nothing in the "Minister's Manuel," telling you what to do or say. But, as it turned out, the preacher didn't have to say or do anything. The grandson took over the service. When the five year old boy finally got to his feet, he looked fiercely at the soldiers that fired the shots, and said with language that caused all to blush, "You bunch of ---- ---- ---- ---- you done shot my grandma." Grandma wasn't dead, but the Nazarene preacher said many almost died with laughter, at the scene in the graveyard that day. So, if you are ever at a military funeral, and the 21-gun salute is fired, hold on to grandma. Don't be like the five year old grandson, who in the time of trouble, "laid his salvation down." Having bitterness in your heart can be described as holding a scorpion in your bosom. The results will be very painful. The most miserable people I know are bitter people. Bitterness hurts our own lives, but it also hurts the ones around us. When we are bitter, and unforgiving toward one another, we act in unkind ways. I once asked a trucker if he would save his wife from drowning. 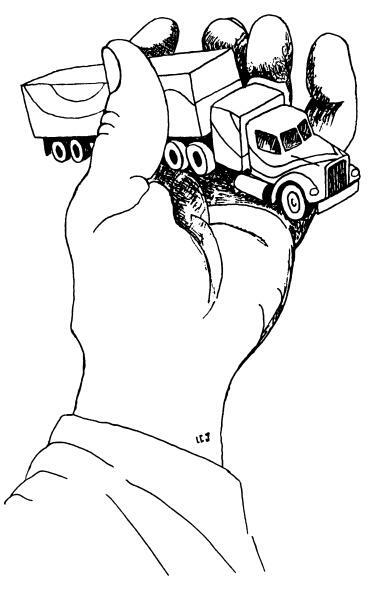 The trucker replied, "It would all depend on whether or not we had been arguing." After the answer I just prayed that his poor wife would never go swimming after an argument. Bitterness is something you can't hide. It always shows up in your actions, and in your words. Like a woman who once told me that because her husband had run away with another woman she was going to kill the "other woman." With that statement she walked away. But, several hours later she came back and said, "I've changed my mind. I'm not going to kill the other woman. I'm going to kill her mother for having her." She thought that would get to the very root of her problem. But, getting to the root of the problem starts with ourselves. When people hurt us, the outcome of the matter depends on our actions, not theirs. If we harbor evil thoughts, gossip, or think of ways to "get back," the hurt will never end. But, if we pray for them, forgive them, and refuse to gossip about them, their deeds cannot hurt us. Then God can work on our behalf, bringing peace and victory to us. If you have a root of bitterness growing in your life, and find yourself sowing seeds of unkindness, beware! Because you "reap what you sow." Repent of bitterness, 'Cause the one you save from drowning today, may be yourself. for Christ's sake hath forgiven you." Have you ever had a pity party? You start to feel sorry for yourself, and when you pray, you tell God how hard life has been on you; when you do that, friend, you're having what I call a pity party. I was once told of an evangelist who had a pity party in a restaurant one night over a hamburger. The evangelist received the hamburger he had ordered, when he happened to notice a drunk man sitting at the table next to him. The drunk was eating the best steak in the house; the evangelist a hamburger. Then in a tearful voice, the evangelist prayed and said, "God, here I am your child, I'm eating this dry old hamburger, and look, there's a drunk eating a big thick steak. Why Lord," mourned the evangelist? Immediately, the evangelist received an answer. God spoke, and said, "You ordered, I didn't." The evangelist finished his hamburger without any more complaints. One day I was praying one of the "evangelist's prayers," having a nice pity party, when God spoke to me. The Lord said to my heart, "It will be worth it all, it will be worth it all." Friends, don't get down-hearted, or discouraged eating your hamburger. When you complain and grumble, you're ordering, not God. The Lord will not ask you to do anything, or go anywhere, that His grace is not sufficient to carry you through. Be faithful until the end, it will be worth it all. and the waves cover me. 'Cause it's all going to be over after while. 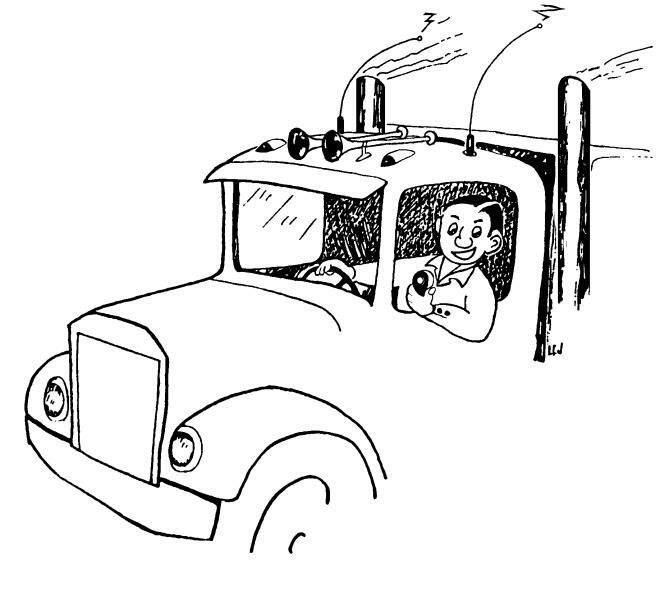 According to most truckers, a good CB and a good antenna is the most important piece of equipment on their rigs. Trucking is easier if they can "express" themselves over their CB's. After hearing some of their CB handles, you can imagine what their expressions can be at times. There are CB handles like Beer-Can, Whiskey Pete, Good-time Charlie, and Dirty Shorts, only to name a few. I firmly believe that constant listening to the CB can be harmful to your mind. There are times the language over the CB can only be described as garbage. Because of CB language a husband and wife team came to our Chapel one day. They were trucking up I-5 with their CB on. They said the language that day was pretty bad, even Dirty Shorts had to back out. The lady picked up her CB Mic. and cried into it and said, "Jesus are you out there?" When she asked that question the airways were silent; no one said anything else. The trucking team then took the first exit they came to and pulled into the truck stop. The first thing they noticed was the name of "Jesus" on the side of the Chapel. Before she called the answer was waiting on them. In the Chapel that day the couple received Jesus as their Lord and Savior. It is something else for us to key our mics and send a message across the airways, but even greater is getting a reply to a message before it is sent. before they call, I will answer." Have you ever had a close friend that you thought would stick with you through thick and thin, only to find out when things got thick they thinned out? Not long ago I had a close friend to become offended at me. I guess what hurt the worst was knowing how suddenly a sweet friendship could turn so sour. Losing confidence in someone can really hurt. One day I was praying for a healing of my heart over my lost friend, when God reminded me of an example of friendship HE showed me years ago. The example was an old black preacher who had come to a community to build a church. With rough lumber, that he cut himself, he alone built the tiny church. For years the black preacher had no electricity in the church. A white family would not give him a right of way across their land [for the power company to run power to the church]. But, that didn't stop him. He used kerosene lanterns to light the church. Years passed and slowly his work began to grow. God then privileged Bunny and myself to put the first coat of paint on his church. As we were struggling with painting the rough boards, in the hot summer sun, the black pastor watched our efforts. He talked with us awhile, and this made our work go easier. He was a precious saint of God. Oh, what wisdom he had gained over the many years he had preached. He had preached for over fifty years before he came to build his little church. After he talked awhile with us he excused himself. He said it was his prayer time. He walked into the church and knelt down at the altar and began to pray. From within the church we heard the sweetest conversation of one friend to another; the black preacher talking to Jesus. Bunny and I could hardly stay on our ladders and keep painting. All we wanted to do was to come down and get in on the fellowship. Several years later Bunny and I went back to see the preacher. We found him sitting alone in the church, talking to Jesus. As we walked in he came to greet us, and he said, "I can't hear well any more, and I can't see well either, but I'm still carrying on for Jesus." He then took our hands and prayed for us. He asked God to bless and keep us. That was the last time we saw the preacher. Shortly after that he was called home to Glory. He traded his tiny church, built with rough boards, for a mansion built by his best friend, Jesus. It is easy for us to get wrapped up in man's friendship. But many times they let us down, and we too let them them down. It is good to have friends, and we must always love them, no matter the circumstances. But, our hope isn't in man. Our hope must always be in Jesus. Through all the hard times, the black preacher had, he always placed his hope in only one, Jesus. A friend that will never leave or forsake, a friend that sticketh closer than a brother, a friend that will see you through until the end -- Jesus! When friends let yo down, don't become discouraged. But keep your eyes on Jesus. When your eyes are fixed on Jesus, man cannot cause you to stumble. When Bunny and I first started in the ministry, we had a gospel tent. We would carry our tent out, set it up for services and be back to our church by Sunday. We always enjoyed the tent meetings, but setting the tent up was something else! It was always just Bunny and myself to do the work. One of my jobs was to hold up the center pole, while Bunny stretched the ropes, and staked down the tent. It usually worked fine, except the time Bunny accidentally let the tent fall on me. There I was buried under the tent, and Bunny crawling under it trying to pull me out. What a sight we were! I always wonder how Bunny would have explained smothering his wife to death with a gospel tent, if he hadn't pulled me out. What a way to go! Over the years we had many experiences with our tent, some good and some -- well, that was the last time I held up the center pole. But, that is one experience I will never forget. One night after we packed the tent, chairs, and all of the equipment into our van, we started home. We had only gone several miles, when we had to stop for gas. As we pulled into the station, a man approached us and asked for a ride. He had run out of gas down the road, and we were going his way. Bunny told him that we couldn't help him because there was no room in the van. It only had two seats, and the tent took up the rest of the room. As the man walked away, God spoke to Bunny's heart and said, "Give him a ride, I sent him to you." Bunny called to the man, I moved onto the motor cover between the van seats, and gave the stranger my seat. We had only traveled several miles when the stranger said we could let him out. As we pulled onto the shoulder of the road, he got out of the van. All of this only took a few seconds. Then as we were getting ready to pull back on the highway, a car traveling at a high speed, zoomed by us on the wrong side of the road. Our hearts melted within us. If we had not given the stranger a lift, we would have hit that car head on. Many times in my mind I have gone back to that night. I can still hear the sound of that car, as it passed on our side of the road, and I can still feel the brush of angel wings, as we were led off the highway seconds before. about them that fear him, and delivereth them"
When I was a little girl there was a country store close to our house. My Mama had an account at the store, but I didn't understand what having an account meant. Until one day I didn't have enough ice cream money, and the lady that run the store said, "Just put it on your Mama's account." That day I found out what "charge it" meant! That day wasn't the end, but the beginning of my using "Mama's Account." every day I would go to the store and get what I wanted, and say, "Put it on Mama's account." This new deal worked so well that I wanted my friends to see how I could "charge it." I started taking them with me, and buying ice cream and candy for all, always using Mama's account. Everything was going well with me, and I had developed a new love for the country store. but, my love was soon to come to an end. It ended at the last of the month, the time Mama paid the bill at the country store. Oh, my -- -- I tried to explain! I didn't know all those candy and ice cream bars could add up to so much. I'll never forget the day the account was settled at the country store. The account at the country store taught me about pay day. But, still there would be another account in my life that had to be settled, the debt of sin. This debt was growing daily, and I could not pay it, no one could, not even Mama. The only one that can pay the debt of sin is Jesus. One night at a revival meeting, I fell on my knees and asked God to forgive me of my sins. At that moment the blood of Jesus was applied to my soul, and my sin debt was paid in full. The account was settled. If you would enter in. In the Bible we are told, "For the wages of sin is death; but the gift of God is eternal life through Jesus Christ our Lord." Romans 6:23. There will be Pay-Day-Some-Day. Settle your account today. Confessing to God that I am a sinner, and believeing that the Lord Jesus Christ died for my sins on the cross and was raised for my justification, I do now receive and confess Him as my personal Saviour.